NuForce has released its Cube, an all-in-one audiophile worthy portable speaker with a powerful built-in headphone amp and USB DAC. NuForce's 2-inch tall, aluminum enclosed cubic speaker isn't wireless, but offers wired connections for superior sound quality and versatile configurations. 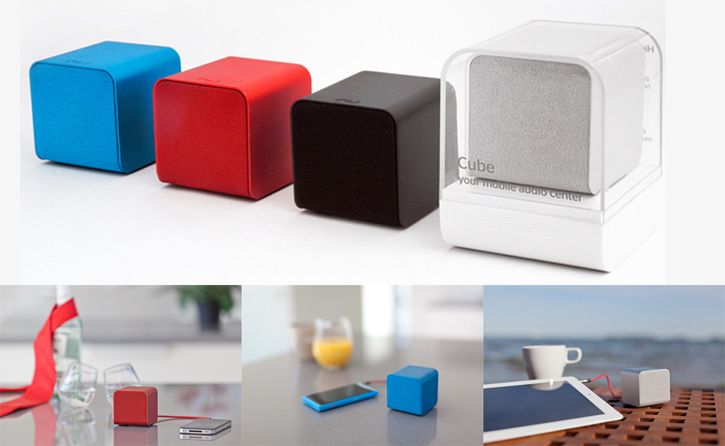 The Cube works as a standalone portable speaker with its built-in rechargeable 8-hour battery and can be connected using a 3.5mm stereo cable, connect to a computer via USB and act as a headphone amplifier capable of driving power hungry headphones with clean, high quality audio. NuForce's Cube may look like a puny speaker, but with a precisely optimized amplifier chip and tuned speaker driver, NuForce claims it'll blow away low quality portable speakers. The Cube speaker includes a carrying pouch, USB and 3.5mm cables and is available now in silver, red, black and blue for $119.